Dubai: The extent of decline in Dubai’s property values may be starting to convince more expatriate residents to opt to buy rather than stay on in rented premises. 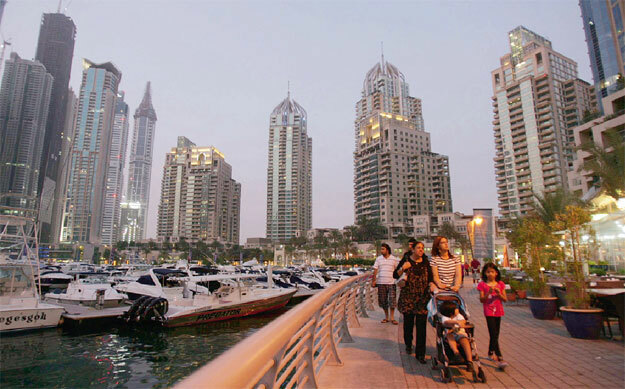 Over the 12 months ending Q3-16, locations with ready-to-buy apartments such as Dubai Marina, JBR, the Downtown as well as more affordable locations — International City and Discovery Gardens — have seen declines of between 2.4 per cent to under 4.5 per cent, according to the latest update from Cavendish Maxwell. And if one were to stretch the timeline from the end of Q2-14 to Q3-16, the decline would be 12 per cent, the consultancy adds. Some estimates reckon the drop to be higher than that, especially in the higher end clusters. But on a quarter-on-quarter basis, the drop in value is slowing down appreciably — the Q3-16 over Q2-16 period showed a dip of only 0.4 per cent in the apartment category. “Buyers are opting to move up the property ladder with a purchase rather than continuing to rent, subject to being able to meet deposit requirements,” said Sofia Underabi, Head of Residential Valuation. Provided they come up with the deposits, banks in the UAE have reasons to look at their mortgage applications with more leniency. In the first eight months, Dubai Marina and Business Bay recorded the highest transaction levels, in line with the fact that they have the highest inventory of ready and off-plan units. And more projects are headed their way, with the Select Group announcing a 31-storey (and 400 apartment) Studio One at the former on Monday. Downtown too is being kept busy with new launches, such as the Marquise Square. According to Cavendish Maxwell, around 5,570 residential units were completed in Q3-16 alone, with 33 per cent of the total completion being delays from the previous quarter. If that estimate stacks up, handovers in the first three quarters of the year would total around 10,000 units, which was about the level achieved for the whole of 2015. The “inflated” number this could be because of the handovers of various delayed projects from earlier quarters. The Q3 completions were mainly in Dubailand, Silicon Oasis and Jumeirah Village Circle. Of the units set to be delivered in Q4, the majority are in Dubailand followed by Dubai Silicon Oasis. Meanwhile, estate agents in Dubai reckon that apartment and villa prices should remain unchanged during Q4. And 75 per cent expect new buyer enquiries to increase, while 69 per cent expect an increase in the number of agreed sales. A majority of those surveyed (63 per cent) believe new seller instructions will also increase during the fourth quarter. Meanwhile, in Abu Dhabi, the fortunes of the property market will sway in line with the movements in oil prices. The realty space has had to go through some difficult readjustments. The 12-month decline in apartment values across the investment zones ranged between 2-4 per cent. “The rate of decline has slowed in comparison to the previous quarter… however, pressures still remain from oil price instability, impact of government spending cuts and job losses in some sectors,” the report states. “Average apartment prices in Abu Dhabi investment zones have declined nearly 8 per cent since highs in Q2-2014, with any recovery in the near term being linked to external factors such as the oil price and global market instability. And as developers in Dubai have already shown, it may be time for Abu Dhabi based operators to start thinking of going affordable. With demand being for smaller units due to “liquidity pressures” on potential buyers, developers will be forced to alter their strategies. * Across Abu Dhabi’s investment zones, apartment and villa rents dipped 1.8 per cent and 2.4 per cent on average during Q3-16. “Four- and five-bedroom categories witnessed the highest declines as job losses and oil prices reduced demand for larger units,” said Jonathan Brown, Head of Abu Dhabi Office at Cavendish Maxwell Rents for super-premium Saadiyat Beach Villas dropped more than those at Al Raha Gardens and Al Reef, with a 2.7 per cent drop in Q3-16. * In Dubai, apartments in Jumeirah Lakes Towers, International City and Sports City posted 12-month declines higher than market average. Across Abu Dhabi’s investment zones, apartment and villa rents dipped 1.8 per cent and 2.4 per cent on average during Q3-16. “Four- and five-bedroom categories witnessed the highest declines as job losses and oil prices reduced demand for larger units,” said Jonathan Brown, Head of Abu Dhabi Office at Cavendish Maxwell. Rents for super-premium Saadiyat Beach Villas dropped more than those at Al Raha Gardens and Al Reef, with a 2.7 per cent drop in Q3-16. In Dubai, apartments in Jumeirah Lakes Towers, International City and Sports City posted 12-month declines higher than market average.